NeatSchool Mass Mail makes it easy to send an e-mail message to one or more Classes, Department or your entire Organization. Many of you find yourselves sending similar messages periodically. For instance, once in a while you send a reminder with your program’s policies. Once a year, you might send a e-mail message about certain celebrations. The exact date, time, location and other details might change but the message remains pretty much the same otherwise. Many of you wrote to share that you dislike starting from scratch every time or having to cut and paste from a word document or other source and then have to reformat the message, change the recipients and options etc. E-mail Templates allow you to save an e-mail message just before you send it. When you save the message you save not only the subject and body but also all the formatting details, recipients, and other options. In the future, you can come back, find the saved e-mail and created a new e-mail message from the saved e-mail. You can then change the e-mail message and send it again. The e-mail templates search feature makes it easy to find a template even when you have accumulate several of them. Using NeatSchool roles, you can control who else can see the saved e-mail template. This way you can also use this feature to review and edit an e-mail message by multiple people before it is sent and send it only when all of them have reviewed it and agree in the content and format. If you want to find more about how the feature works, there is a screencast in the tutorials section of the NeatSchool Help Page. Last week the Santa Clara Public Health Department rolled out new exposure forms. These are forms you use to communicate to families possible exposure to a communicable disease because another student in your program had the disease. As always, you can have the latest forms with the date already filled e-mailed to you from our portal here. In today’s post, I want to explain how exactly mass messaging (i.e. e-mail and SMS) works. This will help you understand who will receive the communication you send using NeatSchool. When you send a message in NeatSchool you address it to one or more NeatSchool entities, each represented by a record. In NeatSchool, there are records like Parent/Guardian and Staff Member that represent one person and contain his/her e-mail address and/or mobile phone number. When you send to one or more of these records NeatSchool simply sends the message using the information in the record. Other records, like Accounts, Classes, Departments and Facilities, correspond to a collections of persons. So when you send a message to such records, NeatSchool has first to find who are the eligible persons to receive the communication. Let’s first start with an Account. When you send a message to an Account, without checking any channels, the message is sent to all the members of the Account (i.e. parents/guardians and/or students) who are marked as Account Managers/owners. If you select one or more channels the communication is sent only to those who have subscribed to that channel. So in the example shown in the figure below, if you send a message to account Doe, both John and Mary will receive it because both are Account Manager/owners. However, if you were to send the message to Doe and also select the Academic channel, only Mary will receive it. When you send a message to the whole Facility, NeatSchool first finds all the active accounts of that facility and then sends the communication to each Account as explained earlier. Please note that this will include parents of future or former students if their account is still active. When you send a message to a Department or a Class, NeatSchool first finds all students who attend the Class or a Class in the Department, and then from each student finds his/her Account and then sends the communication to each Account as described earlier. When you send a message this way, in the Advanced Options, you have the option to include or exclude students who are scheduled to start in the future but have not started yet. In schools with older students, it is common to have the students, who typically are not Account Managers, subscribed to the Academic channel. When the teacher sends a homework related communication she sends it selecting the Academic channel so that all the students receive it. Let’s look at a concrete simplified example. Let’s say you have an organization with one Facility called Little Star as shown in the figure below. The figure shows three Accounts, three Classes and one Department. If you send a message to the “Little Star Accounts & Staff Members” with no channels selected, the message will be sent to all three active Accounts Doe, Smith & Bone and the three active Staff Members which will be 7 e-mail addresses: john@test.com, mary@bar.com, jsm@foo.com, jb@test.com, mado@bar.com, dofo@yah.com,ninf@test.com. Notice that Nand Smith will not receive the message because she is not an Account Manager/Owner. If you send the same message selecting the channel Academic, only three Parents/Guardians will receive it, the ones who have the Academic channel selected. The total e-mail accounts will be 6: mary@bar.com, nasmi@test.com, jb@test.com, mado@bar.com, dofo@yah.com, ninf@test.com. Now, if you send a message to the Department “Elementary Accounts & Staff Members”, the message will go to the staff members associated with the class (Mary Don and Donna For) and the accounts of the students in these two classes (Doe & Smith). This will be the e-mails: john@test.com, mary@bar.com, jsm@foo.com, mado@bar.com, dofo@yah.com. In the Advanced options, there is a checkbox that determines whether future students will be included as well. If you check this box, the message will also be sent to John Bone. Today I want to address an issue that confuses many of the NeatSchool first time users. In NeatSchool, we store information in records. A person’s information is stored in one or more records. Each Parent record, Staff member record, Partner record have an e-mail field. When the administrator sends an e-mail that needs to be addressed to a person the e-mail address in his record is used. In a similar way, when the system needs to send a notification that involves this person, the same e-mail address is used. Any valid e-mail address (Google, Yahoo, Microsoft, you name it…) will work. This is exactly what one would expect from such a system. NeatSchool also provides a Portal for Administrators, Parents and Staff Members. For instance, a parent can login to her portal and view their billing information. Anybody who can login to the portal is a NeatSchool user and has a NeatSchool record username. In order to login to the portal, a NeatSchool user needs to prove that he is who he claims to be. Most systems today use a user name and a password for that purpose. When we started NeatSchool we could have built an authentication system and administer these user names and passwords. However, secure authentication done right is tough so instead we decided to leverage Google’s authentication infrastructure. Because of that decision, in order to login to the NeatSchool portal every NeatSchool user needs a Google account. One can use an existing Google account or get a new Google account for free here. When a NeatSchool user registers to use the portal she associates her Google account with her NeatSchool user record. Now, the Google account username could be any word but—maybe unfortunately—Google decided to be an e-mail address. This e-mail address is only used to authenticate a user to Google and consequently to NeatSchool. This e-mail address can be the same e-mail address used in the records of the user or it can be a different one. If it is a different one, the e-mail address of the Google username is never used to send e-mail. In fact the Google username is not shown anywhere in the NeatSchool system. Let’s look at an example. 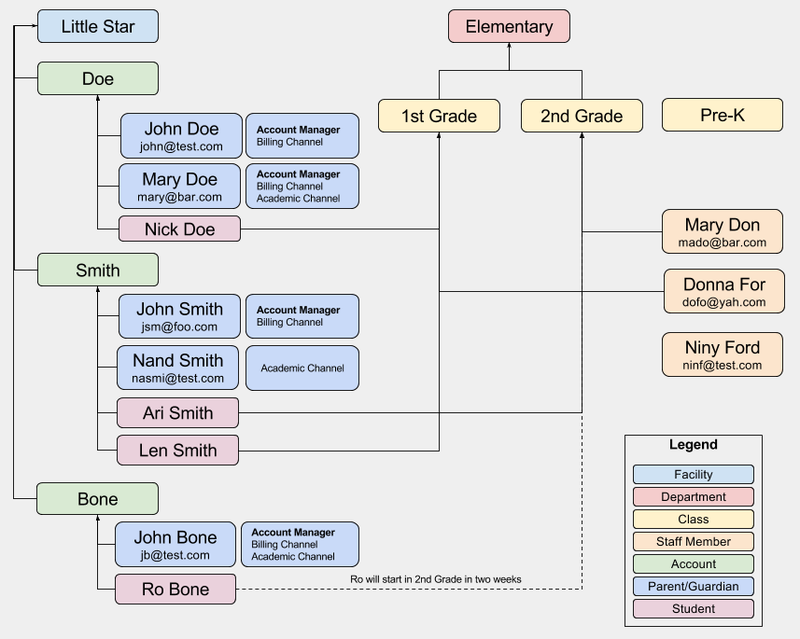 The diagram above shows George Doe who is both a parent and a teacher in a NeatSchool managed program, a rare but possible situation. When the school sends a message to all the parents of the program, George will receive the e-mail in his george@example.com account. When the school sends a message to all the Staff Members, George will receive the message in his george@test.com account. George has registered so that he can access the NeatSchool portal of his program. When he browses to the portal URL a Google authentication page will ask him for a username and password. George will use his foo@bar.com Google account. While inside the NeatSchool portal wherever a user name needs to appear George will see his NeatSchool username that is george. Did this help? Do you have questions? Please add them in the comments below so others in the future can benefit. We recently introduced automatic payment reminders and wrote about it here. 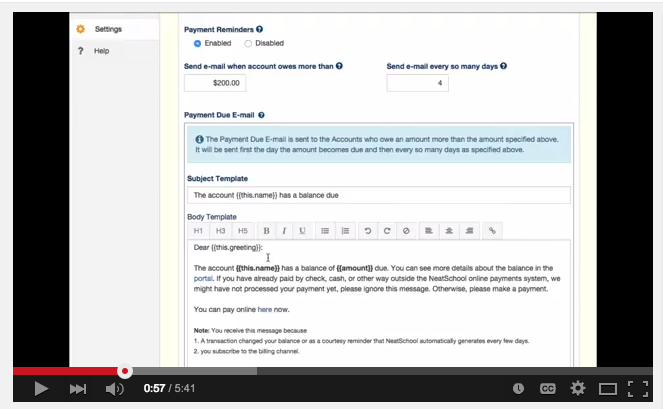 Last week we released a new screencast that shows step by step how to turn automatic payment reminders on and how to configure this capability. You can find a link to this and all the other NeatSchool screencasts in Help. One great thing about using NeatSchool to organize your program is that NeatSchool uses the enrollment and class assignment information to automatically create and maintain e-mail lists. You can e-mail the whole program, a class, the members of an account etc. Unlike other e-mail and group systems that you might be using the NeatSchool mailing groups are automatically maintained as a byproduct of keeping your NeatSchool portal up to date with information about students who join or leave the program. 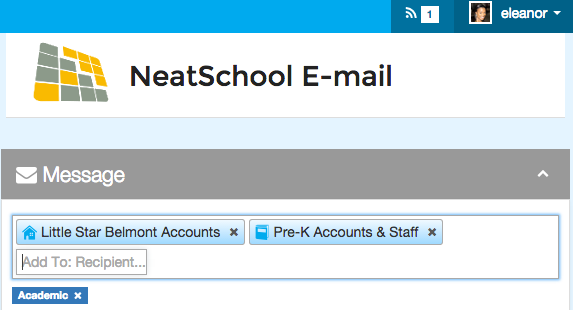 We recently published a screencast that details how you can use NeatSchool mail to communicate with your program. If you are a NeatSchool subscriber you can find the screencast in the Help Section under “Sending Mass E-mail & Text Messages with NeatSchool”. Otherwise e-mail us to send you a link.